This game actually originated as an old carnival game, and the odds of winning at it are just as scarce. The wheel is 6 feet wide in diameter, consisting of 54 slots. Each slot has a symbol on it: $1, $2, $5, $10, $20, Joker, and a casino logo. These logos and symbols affect how much you win and what is considered a win. The player then places their bets based on the symbols. They payout is determined by the cash value that is with the symbol. The joker actually has a forty to one payout if it is chosen, which sounds good in theory. Even though it sounds like a great win for anyone to land on the joker, the truth is rather different. Your actual chance of hitting the joker is fifty three to one (fifty four slots total) and yet you are only getting paid for forty to one odds. Players usually calculate their chances of winning by learning about the house advantage. This allows them to know what their chances really are of winning some money. The lower the percentage is, the higher the possibility of you winning. 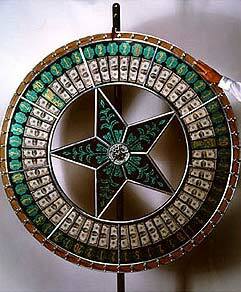 The house edge for Wheel of Fortune can fluxgate from eleven to twenty four percent, depending on how it is played. Some casinos try to advertise the fact that they offer forty five to one odds, but that still results in a fourteen percent house edge. That percentage of a house advantage is still too high, resulting in you losing your money much too often. There is no two ways about it, this game should be avoided at all costs. There is no payoff if you win, it is just a diversion to take your money. Casinos usually place this game right next to the exit so that customers will play it really quick in hopes of making some cash. Don't fall into this trap, make sure you keep your distance from this game. Also, this game does go by the name of the Big Six Wheel, so make sure you avoid that game as well. With low odds of winning and a payout that's not even worth the effort, Wheel of Fortune is one of the worst games you can play. This game is based too much on chance, and the odds are actually against you. There is no benefit to playing this game, even if you win. Be a smart player and know what you're getting into. The casino is hoping that you aren't as smart as most people; don't let them get the upper hand. Play the games that have better odds and allow you to win money.